In Brief: Walk from Gubeikou to Jinshanling, following stretches of restored and unrestored Great Wall and taking a detour through the pretty farmland that surrounds Hemp Village, finishing all the way over at the eastern end of Jinshanling. A wide view of the Great Wall at Jinshanling. The hike begins at the Gubeikou section of the Great Wall in Miyun County, very close to the border of the Beijing and Hebei provinces. Even though it’s designated as a park, this section of the Great Wall is largely unrestored. It’s not often visited either, probably because it is so far away from central Beijing. We’ll start the walk with a short climb up to a tower on the Wall. There are a lot of towers on this stretch of the Wall – some in good condition, some tumbled down to foundations only. From the first tower we can see the Wall stretching off into the hills of northern Miyun. We’ll be following it the other way, towards Jinshanling, and Hebei Province. It would be nice to walk on the Wall all the way to Jinshanling, but part of it borders military land and that section of it is blocked off. This means taking a detour through Spider Valley! When we first hiked this trail, the bushy path through Spider Valley was draped with cobwebs and we saw many a big fat spider sitting in the middle of their web. These days, there are fewer spiders. On the way through Spider Valley, we’ll walk by an abandoned house, wells, and water stores, as well as the occasional cobweb. Once we’re out of Spider Valley we’ll start getting into the fields that surround Hemp Village. There are about 100 people living in this valley, surrounded by hills on all sides. They mostly grow corn in this area, but in the right season you can spot hemp and tobacco, and there are donkeys, cows, chickens, and dogs around as well. Before we arrive at the main part of Hemp Village we’ll make a turn-off and head back up towards the Wall, following a trail up the valley. It will take about forty minutes to get up there, and parts of it get a bit steep. There are good views at the top – Gubeikou Wall one way, Jinshanling Wall the other – and we’ll stop for a snack and a bit of rest before heading down to Jinshanling. Along the way to Jinshanling we’ll get a different view of the wall, walking a trail by the base of the Mongolia side, and making a few tricky ascents and descents on the way to the archway that will get us back on top. This section is the west side of the Jinshanling Great Wall. We’ll be following the Jinshanling Great Wall from west to east, starting off on the unrestored section before heading down into the main restored area. We’ll head straight through the restored area, and on towards the Simatai Great Wall. Once we reach the end of the Jinshanling section, we’ll be able to get good views of much of the Simatai Great Wall, including the steep eastern ridge where the famously hard-to-reach Sky Bridge and Fairy Tower are located. After a little look over that way, we’ll leave the wall and head down a paved park trail. This trail leads down a valley, and after about thirty minutes we’ll arrive at the bottom and meet our bus. Before heading back to the city, we’ll have a late lunch (perhaps around 2-3pm) at a local restaurant. The cost of food and drinks is included in the price of the hike. There are a few tricky and slippery sections midway, and a whole lot of stair climbing on the Jinshanling section. See 42 photos from a beautiful spring day on the trail between Gubeikou to Jinshanling. We did the Gubeikou to Jinshanling Great Wall hike on a fairly chilly day—see a set of 12 photos of hikers, wall, and winter scenery. Cold but beautifully clear weather on one of the last hikes of 2018—see 18 photos from the Gubeikou to Jinshanling Great Wall hike. It was a cold and windy walk from Gubeikou to Jinshanling—see 11 photos from the hike. Awesome autumn colours and super-clear blue skies made this an amazing hike—see 53 photos from the hike from Gubeikou to Jinshanling Great Wall East. See 31 photos from a hike from Gubeikou to the Jinshanling Great Wall, on a nearly perfect day. Take a look at a set of our favourite photos from a hot day of hiking from the Gubeikou Great Wall to the Jinshanling Great Wall—big blue skies, green hills, and great views. A super set of snow shots from the Gubeikou to Jinshanling Great Wall hike. See 19 photos from a hike on the Great Wall from Gubeikou to Jinshanling. The Jinshanling Great Wall is open again, and we hiked through from Gubeikou to check it out—see 27 photos. Fourteen photos taken on the hike from the Great Wall at Gubeikou over to Jinshanling. See photos of Great Wall and green scenery from our 5+ Gubeikou to Jinshanling hike. Photos from the 2012 edition of our annual Great Wall Christmas hike. 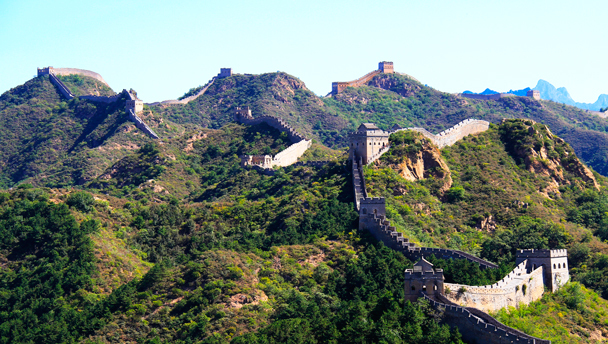 This hike starts at the Gubeikou Great Wall and continues to Jinshanling. Most of it is on an unrestored section of Great Wall and as such, tends to get less traffic than recently renovated sections of the Wall. The last section however, at Jinshanling, has been beautifully restored and gives one a good idea of what the wall probably looked like at its height more than 400 years ago. Click through for photos and more! We did the excellent Gubeikou to Jinshanling hike in clear weather on March 24 – click through to see photos of blue sky and Great Wall. Every year we do a Christmas hike, usually walking a nice stretch of Great Wall before a feast of food at a local restaurant. For 2011, we did the Gubeikou to Jinshanling Great Wall hike – click through to see a whole lot of Great Wall photos! We hiked restored and unrestored sections of Great Wall on this trip, visiting Gubeikou, Jinshanling, and little bit of Simatai on a day when the weather was near perfect. Click through to see photos and a write up of this hike, including some stats! In November 2009 we went and scouted out an extra bit of Great Wall to walk on at Gubeikou, and this hike was the first time we’d walked the extra section and continued on all the way to Simatai - quite a distance, and most of it on the wall. Click through for statistics and photos from the Gubeikou to Simatai Great Wall Challenge. We found a new place to start hiking at Gubeikou, and were able to add an extra hour of Great Wall walking on this visit. With a clear blue skies, light snow on the ground, and no other hikers in the area, this was a particularly fine day of hiking - click through to see the photos and read the stats.